The Association of TeleServices International (ATSI) is the leading trade association for providers of telecommunications, call center services and answering services. Each year, an independent panel of judges place “mystery calls” to companies participating. This is such an important award to our company because we compete with more than 400 agencies for it. So winning this award serves as proof for all our hard work and determination to deliver the best possible service to our clients and customers! 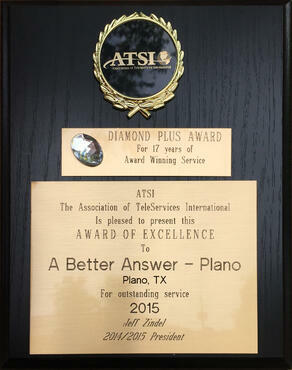 A Better Answer has been honored with the exclusive ATSI Award of Excellence for 19 consecutive years (1999-2017). ATSI presents this award annually for providers of telecommunications and call center services including telephone answering and message delivery across North America and the UK. All three A Better Answer offices were presented with an award at ATSI’s 2015 Annual Convention held at Hilton Torrey Pines, La Jolla, CA. “It shows we have some of the most prestigious customer service in our industry,”said Dee Hawkins, Owner and CEO of A Better Answer. “We are honored and very grateful to the super team of call handling heroes at ABA.” Our Fort Worth office has won for 12 consecutive years, our Houston office is the winner for the 13 consecutive years and our Dallas office has been winning for 19 consecutive years.